Origin: West Lincoln, Ontario (My Hometown). While Southern Ontario is hardly a stranger to severe weather in the summer months as the jet stream shifts north throughout the year and sends storm systems our way, the frequency of non-synoptic storm set-ups (in this case, lake breeze surface boundaries giving birth to borderline severe storms) seems to be a bit above normal to this point in the year (or maybe it's in my head). 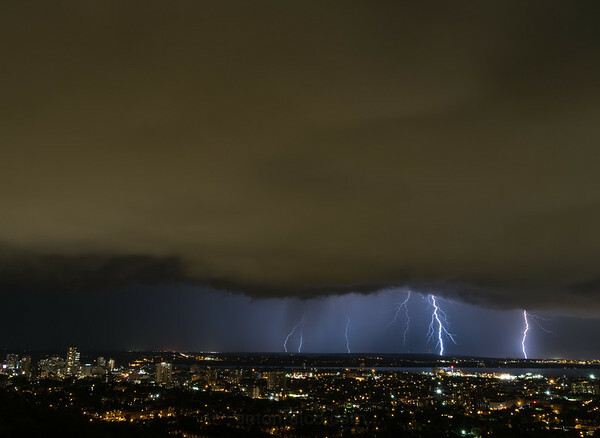 Most of the time, these storms don't present much of a threat, are short lived, and don't offer much in terms of being photogenic; worse cases usually present large amounts of rain, some lightning, and occasionally a strong wind threat as the downdrafts from the multi-cells unleash their payload of water. 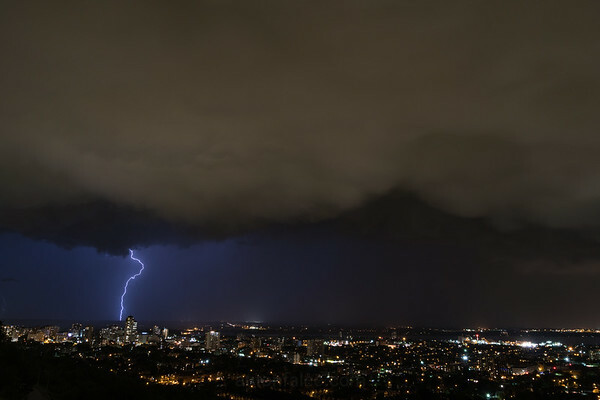 Southern Ontario had gone a few weeks without seeing a major severe threat from a synoptic set-up, or something to forecast a few days in advance. August 11th changed this trend. Interestingly enough, despite knowing that August 11th finally presented a synoptic set-up that I liked when looking a few days ahead on the weather models earlier in the week (It offered a 500mb low pressure system pushing across the Great Lakes from the west, and a cold front for storm initiation), I very nearly decided to head home early. I knew this day would have the potential to feature some strong thunderstorms and a low chance of a tornado or two; the usual question was where initiation would take place, and if I'd be able to get to them in time (I'd be going after work). -CAPE (which looked good, and was around 2000 J/kg in the early afternoon and increasing), -Shear (0-6km shear was around 40kts), was plenty strong enough to support super cell development. Combine this information with a strengthening Low Level Jet set to hit later in the day, 0-1km shear over 10kts, and the Storm Relative Helicity values being noticeable (higher amounts tip you off to cyclonic updraft rotation, or super cells), and the day looked promising. I had to choose between three targets, which was uncommon ( I usually have one or two): a) Southwest towards the Chatham area (which did produce a small tornado later in the day), b) The Grand Bend area, or c) An area of ongoing convection towards the Listowel area. The amount of ground to cover between these three targets is significant, so I'd likely only have one shot at one target unless I changed your mind along the way. I originally chose target 2, the Grand Bend area, for a few reasons: 1) CAPE, and SRH, were quite high in this location and east of there. There were a few strong storms already in progress ahead and along the cold front, which as of 4pm EST, was located at the western shore of Lake Huron in Michigan. A storm that was crossing Lake Huron at this point in time looked like it had rotation, and may have been producing a waterspout. 2) Severe/Tornadic parameters were the same on the eastern shore of Lake Huron (Grand Bend) at the time I was leaving my place, so I figured the ongoing cell on the lake, and any other cells along the cold front would be heading into a good weather environment. I was hoping for some combination of waterspout, lightning, shelf cloud and/or good structure. I started traveling west, and around Paris, Ontario, I started having doubts about the original Grand Bend target. Despite the environment looking good for storm development, the storms over eastern Michigan and over Lake Huron were not maintaining strength; they were weak and/or dying before coming ashore. I decided against the Chatham area because of how little area I would have to work with between Lake Ontario and Lake Huron, as the storms here were moving southeast. The environment was great here as well, but geography played a large factor in my decision not to pursue this region (and yes, one storm here did produce a brief tornado). 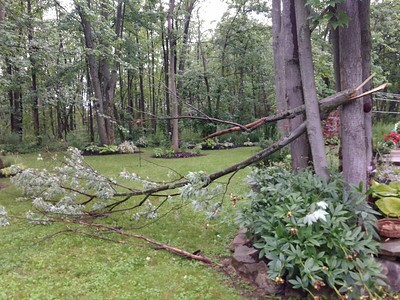 I now only had one target area left: the Listowel region north of Kitchener-Waterloo. This was the point where I considered pulling the plug. It would take about an hour to get toward Listowel, and the ongoing storm did not look terribly impressive; even on Canada's not-so-good Doppler radars. My impatience has cost me many photogenic storms in the past, and since this storm was really the only game in town, and keeping in mind the cold front's advance, plus the increasing LLJ (low level shear) and higher SRH values around the Kitchener-Waterloo area (and because I didn't want to go home so early), I decided to push north and hope that the improving environment that was conducive to rotating updrafts would produce something good. 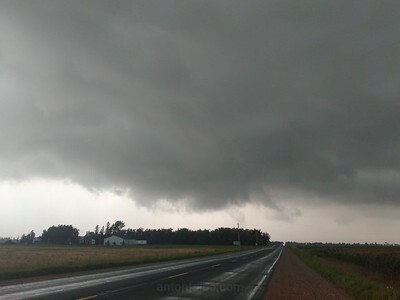 My target area was just east of Listowel, where the storm was showing signs of strengthening in the hour or so it took to drive up to the area. 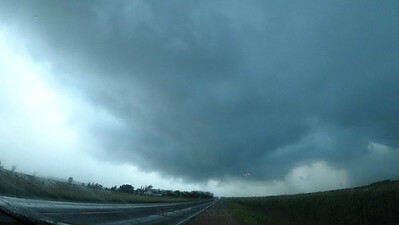 Rotation, while not strong, was apparent on radar. It was also showing signs of developing a "hook echo", or an area of the storm where you'd look for a potential tornado. I didn't get as many pictures as I would have liked because I was driving and trying to catch up to the storm, but here's a few cell phone shots of wall clouds and low level rotation. Luckily, storm motion was quite slow, so we did catch up to it. 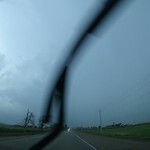 With my girlfriend navigating, we pulled over next the storm just outside Linwood. Over the next half hour, it produced at least 3-5 wall clouds (as you can see in some cell phone pictures above and from the time lapse video to your right), with some potential short lived funnel clouds as well. Shortly after seeing the rotating wall cloud in the time lapse video (around the 1:20 mark), the storm became heavily rain wrapped. You could no longer see the mesocyclone. As a result, I decided to head south toward Wellesley which was clear of rain, and push back to the east to keep pace. What I did not account for was the storm maintaining its rotation and strength with the surrounding showers being engulfed into the storm with "back building", or when new storm development takes place to the west/south western side of the storm. As you'll see in the time lapse, there was nowhere to drive that didn't go through intense rainfall. Normally a southward or easterly retreat makes for a relatively clear drive. Back building did not allow for this. Driving through the high winds (I'd estimate them around 75km/hr) and torrential rain made keeping up with the storm on the busy country roads difficult. 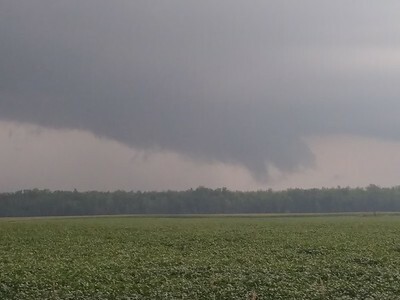 About 20 minutes after the mesocyclone disappears in the rain, this storm did go on to produce an EF-2 tornado that, unfortunately, damaged property around the Hawkesville area. 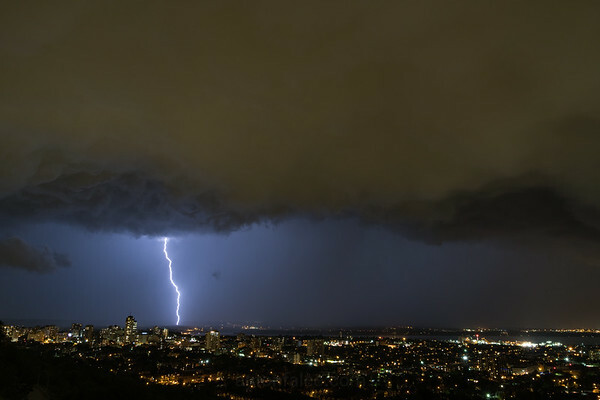 This storm was a dangerous one because of the extreme rainfall over the slick country roads, and the rain wrapped storms obscuring deadlier forces within. I decided to push through the rain after I knew the worst of the heavy precipitation and rotation was further to my east, and headed south and east back towards Hamilton. 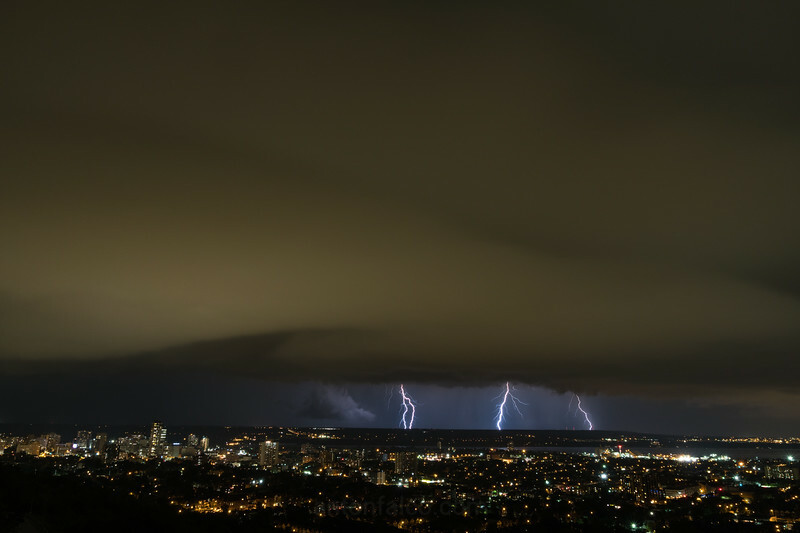 By that time, the storms had congealed, lost any signs of rotation (which was great news because the further east of Kitchener-Waterloo you go, the area becomes heavily populated), looked to be losing supercellular structure, and because it was around 9pm EST, it was getting dark. 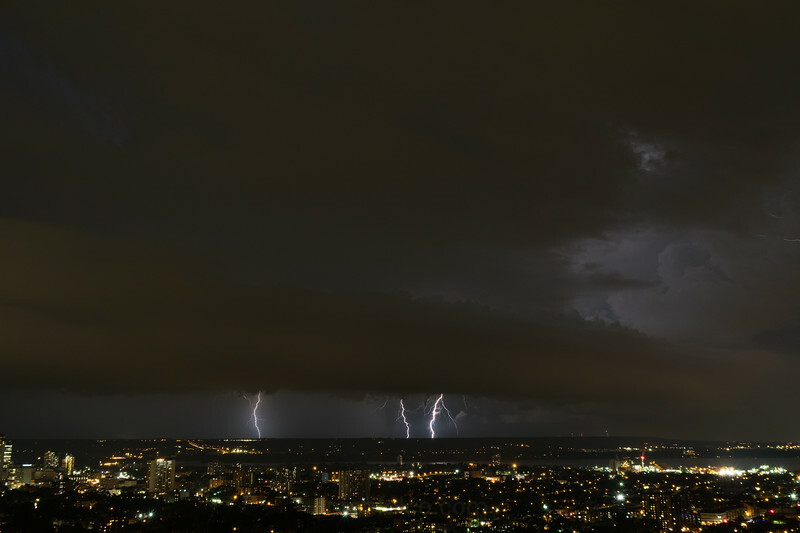 Movement of these storms was very slow and they were producing astonishing amounts of lightning; many of which were making contact with the ground. One line of storms, the one I planned to target, was oriented from southwest to northeast from Brantford to Burlington, and moving very slowly east. 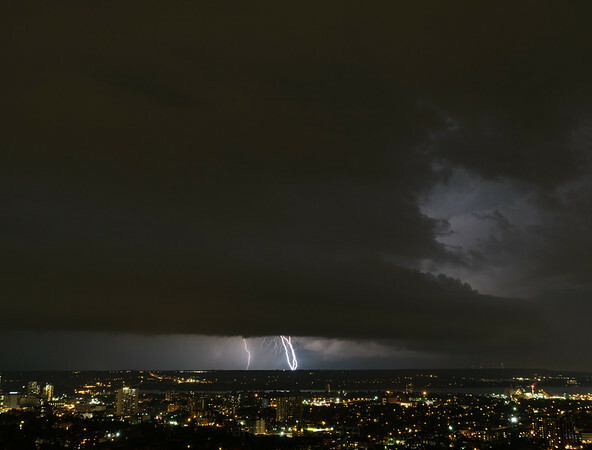 I found a nice area by the Hamilton escarpment around 9:30pm, set up my camera and let the storms come to me in a lightning time lapse. You will see the results the time lapse video below, as well as some pictures (this one is definitely worth watching). When dropping my girlfriend, I stopped for some images of the very mean sky above in Binbrook. You can see that picture below as well. It followed me home, ponded the roadways the entire way home, and made me wait in my car for 10 minutes for it to pass unless I felt like getting soaked or struck by close range bolts. Destination: Home. And to work on little sleep the next day.